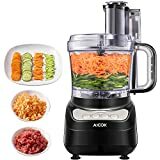 If you’re looking to whip up mayonnaise, slice and dice carrots, mix up some purée, or finely chop onions without any fuss… then a food processor is just what you need! Unlike blenders, standard food processors can do the tasks of almost any kitchen aid mixer or chopper and they don’t need liquid to do it. With the right food processors and the right accessories, anything is possible. To help you choose just the right one, we have put together this food processor buying guide so you can easily choose the perfect processor for you. Bowl Food Processors: These food processors, with the help of some handy accessories, perform many kitchen tasks easily. The cook drops food into a vertical unit above the bowl which is then processed or cut to their requirements and dropped into a bowl underneath the unit. Compact and inexpensive, they are great value appliances. Continuous Feed Food Processors: These processors allow chefs to put food through continuously, depositing processed food into a separate container. They make for quicker chopping and dicing and allow users to process more food at once. Combination Food Processors: Offering a combination of bowl and continuous feeding, these processors allow for a lot more versatility and allow you to prepare and experiment with a lot more recipes. 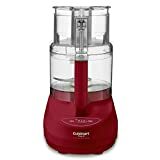 Buffalo Chopper Food Processors: These are heavy duty appliances designed for heavy duty cooking and can process even the toughest vegetable or trickiest meat. They have a lot of space for accessories and add-ons like grinders or slices and are ideal for serious chefs. Specialized Food Processors: These are food processors designed to do specific kitchen jobs perfectly. 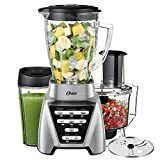 They include choppers, blenders, juicers, spice grinders, and mixers and fall into categories of their own. Operation: Food processors that are powerful and fast are definitely king according to online reviewers. Owners that have processors that can slice even the hardest vegetable quickly are the most satisfied with their purchase. Size: Compact processors review well. People like the less cumbersome look of compact units as well as the fact that they require a lot less storage space. Assembling: Reviewers want good, clear, easy-to-follow instructions when they open their processor for the first time, and models that provide that get much higher reviews. 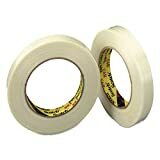 Finding a top brand with good reviews about ease of use and assembly will ensure great satisfaction. Value for Money: People want all the power for lower prices, and processors that offer this value are rated much higher than those that don’t. Things like long term warranties and more power for the money all help increase the ratings of a food processor. When choosing the size of your food processor, think about your cooking needs. Processors with a capacity of 9 cups and over offer maximum versatility as no recipe will be too big for this machine. Units with a capacity of around 5 cups are better suited for chopping and dicing smaller quantities of food. Twenty cup capacity models are available for serious cooks and professional chefs. How much kitchen space do you have? If you have a smaller kitchen and don’t have a lot of storage room, then go for a simpler, more compact machine. If storage is no problem and you are an avid cooker, then look for a larger appliance with a host of accessories for more versatility. All food processors should include a bowl that locks into the base, a feed tube, an s-shaped blade for cutting, and single speed and pulse features and added discs for slicing and shredding. In general, the higher the wattage (watts) of a food processor, the more powerful it will be. Although this only generally applies to good quality reputable brands, some models can come with up to a 25 year warranty on the motor! Opt for a dishwasher safe food processor to ensure easy cleaning. Looking for a model with touch-pad controls instead of raised buttons will also ensure your unit is easy to clean. Attachments will add a lot more versatility to you food processor, and some popular add-ons include a mini bowl and blade for smaller tasks, plastic blades to use for mixing, a pusher to help you safely push through items for processing, different discs that turn your processor into a slicer, grater, and shredder, whipping attachments for egg or cream, and even attachments that will turn your processor a blender and juicer! When choosing your accessories, think about storage space! Models that include a storage box or compartment will make sure your parts are easily stored and always packed away neatly in one place for easy finding. 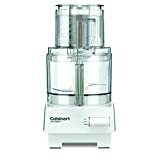 Cuisinart: Cuisinart food processors have been hailed by culinary experts and celebrities since they entered the American market in 1973. Today, Cuisinart is a universally recognized name, endorsed by culinary connoisseurs such as Jacques Pépin and Hubert Keller. Hamilton Beach: As one of the country's leading distributors of small kitchen appliances, Hamilton Beach Brands, Inc. sells over 35 million appliances every year and they are renowned for their good quality food processors. Black & Decker: Formed in 1917, Black & Decker invented the first cordless drill which made them a huge success. Taking this knowledge and technology, they have grown into a company that supplies both quality tools and electric kitchenware too. Breville: The Breville brand became a household name for home appliances when they invented and introduced the sandwich toaster in the 1980s. They are now not only the leading sandwich toaster manufacturer but are also known for their good quality blenders, food processors, juicers, and more!